I was having one of those driveway moments. A news story on NPR had caught my attention as I pulled into the Cable Community Farm, so I cut the engine and stared into space while listening to its conclusion. First my eyes were drawn to yellows and purples of the brightly blooming pollinator garden near the farmhouse. Then the movement really caught my eye. A big bush of purple aster flowers was absolutely fluttering with activity. There was no quiet place to rest my gaze. Bees buzzed along of course, but the butterflies really stole the show. Forgetting the news story, I hopped out of the car, grabbed my camera, and went to investigate. My first hope was that this was a cloud of Monarchs, since their plight has earned my sympathy and I’m cheering for them as underdogs. But although they shared the same orange and dark base colors as Monarchs, the pattern on these butterflies was distinct. Black-and-white upper corners highlighted orange wings with dark brown spots. These dozen or more afternoon visitors were Painted Ladies. While Monarchs are lauded for their incredible migrations, they aren’t the only migratory butterflies; they are just the one with the most dependable schedule. Painted Ladies are incredible migrators, too, and travel from the southern U.S. and Mexico up to the northern U.S. and Canada. Some years we barely notice them, and some years they are wildly abundant. Also called the Cosmopolitan, they are found on every continent except Australia and Antarctica. 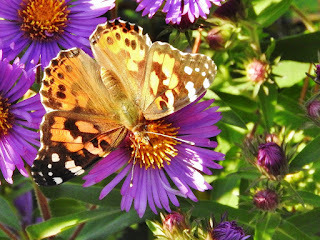 Painted Ladies are the most widely distributed butterfly in the world. They migrate by the millions from North Africa, the Middle East, and Central Asia up to mainland Europe, and bestow upon Britain and Ireland the same spectacle we’re witnessing now. While the butterflies interrupted my NPR driveway moment, they’ve become news on their own. 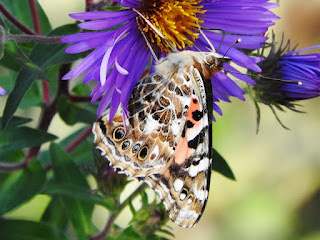 Newspapers in Colorado and Quebec have reported on giant flocks of migrating Painted Ladies in the past few weeks, and the Vermont Center for Ecostudies sent out an e-newsletter encouraging people to report sightings on e-butterfly.org, a sister site to the more familiar eBird.org site developed by the Cornell Lab of Ornithology. Why is there such an influx of these beauties this year and this week? First, there was a particularly large and early flight north last April and May. According to Iowa State University researchers on their Painted Lady Research Site, a strong El Niño event in the Pacific Ocean dumped rain on southern California last winter. The desert bloomed. Painted Lady caterpillars aren’t picky eaters, and so found plenty of host plants, and then proceeded to munch them down. When those caterpillars became adults, they needed to move on in order to find a new food source. Scientists have long noticed a connection between Painted Lady abundance and El Niño years. Our mild spring weather then allowed for an early northward migration of a now-abundant flock. The pioneers headed across the U.S. and far north into Canada. Painted Ladies were spotted in Iowa as early as March 10, which is two months earlier than normal. With such an early arrival, the butterflies were able to have two generations instead of just one. Together, these factors resulted in a population boom. Normally that abundance of butterflies wouldn’t be visible to us, because they typically migrate at an elevation several thousand feet in the air in order to take advantage of favorable wind currents. Using the wind, they can travel up to 100 miles a day, and reach speeds of nearly 30 miles per hour. Recently, a strong southern weather flow has brought the migrators down. It’s not efficient for a tiny butterfly to try and fly against the wind, so they are taking a break and refueling. That’s why we’ve seen such amazing numbers nectaring on flowers (and getting hit on the road) recently. As soon as the winds change, though, the little beauties will take off. Wisconsin is too cold for either the chrysalis or adult to overwinter, so they must take refuge to the south and recolonize our gardens each summer. Speaking of gardens, as I observed the swarms of butterflies, bees, wasps, flies, and other insects that crowded each goldenrod frond, sunflower face, and aster fringe, it was abundantly clear that what we plant matters to wildlife. This pollinator garden at the Cable Community Farm was thoughtfully laid out by Sarah Boles of Northern Native Plantscapes. She made sure to include flowers that would bloom early, late, and throughout the summer in order to provide a continuous source of nectar and other resources. So the beautiful abundance that we’re witnessing this fall is due to many factors, not the least of which is the fact that at some caring humans make it a point to provide habitat for a species other than our own. Now that’s what I call a driveway moment. Find more ways to CONNECT with Natural Connections! Lois Nestel, the Cable Natural History Museum’s founding naturalist and director, loved mushrooms. She ate them, sculpted them, painted them, and taught the community about them. We still proudly display her work as part of our collections. This past weekend, September 7-10, the Museum once again found ourselves immersed in mushrooms, and I think Lois would have loved it! The North American Mycological Association (NAMA) holds an annual foray every year in a different place. This year it came to Lakewoods Resort, east of Cable, WI, on Lake Namakagon. Last year it was held in Front Royal, VA, near Shenandoah National Park. Next year’s foray will take place near CraterLake, OR. Keep track at namyco.org. Usually a local mycology club hosts the annual foray, but since the Cable Area doesn’t have a club, the Museum stood in. I coordinated the field trips (among a zillion other things) and recruited a swarm of volunteers to help with everything from driving vans to running the information desk. We all had a blast. Ed Johnston ran the Museum Shop's table in the vendor area for at least one shift. We sold LOTS of mushroom books to forayers, and have additional books still in the store. Thursday began slowly, with out-of-towners just beginning to arrive. One of the early birds, Jay Justice, a free-range, free-lance field mycologist from Arkansas, kindly agreed to give a short lecture and field walk for the public at the Museum on Thursday morning. Thirty-five people hung on every southern-accented word and gathered ‘round as we walked less than a block but still found plenty of mushrooms to look at. In the afternoon, I led a field trip to Paine’s Island on Lake Namekagon. It’s privately held, but the owners are Museum members who are interested in mushrooms. In exchange for welcoming strange mycologists into their haven, they were able to join the foray. Our pontoon driver was also Museum member and amateur mycologist. Together, we scoured the forest for mushrooms. Well, more like we started walking and then had trouble not squashing mushrooms wherever we stepped! One fallen log-a mossy old basswood trunk-was a mycological gold mine. The longer we looked, the more we found. The most visible fungi were artist’s conks-the firm shelf fungi with white undersides you can draw on. Looking closer we discovered a Lilliputian world of slime molds, jelly fungi, cup fungi, and more. Glowing orange clusters of mushrooms drew us further into the forest. Shimmering lilac caps brought us to our knees. I stayed with a group moving slowly, distracted at every turn by new fungi. Part of the group took off at a brisk pace, and circumnavigated the island. One of them came crashing out of the forest after an hour or so, glowing both from sweat and excitement. In her hand was a bouquet of tiny parrot waxy caps. The ¾ inch diameter caps were a glossy pea green, while the stems were melon orange. Her smile was jack-o-lantern bright. This was a “lifer” for her, a mushroom that had been on her bucket list for years. Friday and Saturday brought more abundant fungi, as the foray jumped into full swing. Four field trips with two 15-passenger vans each rolled out of the parking lot at 8:30 a.m. and 1:30 p.m. sharp. Other attendees could choose from any of three simultaneous lectures each hour. When the field trips returned home, their mushroom baskets were piled high with specimens tucked neatly into waxed paper bags, each with their own voucher slip containing information about where the fungus was found. The drop-off tables quickly became buried as the scientists and grad students worked to identify, sort, and organize the hundreds of fungal specimens. This is the organized display tent. Even the experts I talked to at the foray-mycologists who have been traveling the world for years--told me that they saw fungi in person here that they’d previously seen only in books. Even people just foraging for the pot had their day to shine. Many pounds of choice edibles like black trumpets, chanterelles, and chicken-of-the-woods went home with happy mycophagists. Black trumpets and other edible mushrooms were not in short supply! Our evenings were spent in the giant convention room, with 350 people eagerly awaiting the announcement of “finds of the day.” Drab, obscure fungi won most of the prizes. These fungi are rarely found because they are easy to overlook. Britt Bunyard presents a "find of the day." It seems as though almost no fungi was overlooked by this group, though. While the total number of species collected won’t be final until after Patrick Leacock, the foray’s lead mycologist (www.mycoguide.com), checks them over at the Field Museum in Chicago, the experts are guessing that we’ll get names on at least 550 species of fungi, collected over just a few days, in an area reaching from Madeline Island to Shell Lake. This breaks the previous record for the number of species collected at a NAMA Foray: 523. The best sample of each species was carefully documented, photographed, and dehydrated, and will be housed in the herbarium at the Field Museum alongside 20 years’ worth of these vouchered specimens gathered at NAMA Forays. The NAMA Northwoods Foray was a resounding success. “The best ever!” according to some long-time NAMA members. You can see photos of the event by searching for #NorthwoodsForay17 on Facebook or Instagram. That success was no accident, though. The lead organizer, FUNGI Magazine editor Britt Bunyard, chose Bayfield County because he knew the fungal diversity was incredible. We chose Lakewoods Resort because their incredible staff is accustomed to big events, and also because they are smack-dab in the middle the Chequamegon-Nicolet National Forest and an incredible network of trails. The Museum chose to help because we knew that our volunteers would step up, keep things running smoothly, be thrilled to welcome people to our woods, and hungry to learn more about fungi. With this event, we fulfilled our mission by connecting 350 mycologists from around the world to Northwoods Nature! I think Lois Nestel would be proud, don’t you? Lois Nestel's granddaughter, Sandy, holds a mushroom they found together. Photo by Lois Nestel. Special Note:Emily's book, Natural Connections: Exploring Northwoods Nature through Science and Your Senses is here! Order your copy at http://cablemuseum.org/natural-connections-book/. Listen to the podcast at www.cablemusum.org! Raptor biologists here have a special trick for getting close-up views of the hawks - bait. Using a technique a lot like fishing, researchers pull the string on a lure to make it look like an injured bird. When a raptor swoops down for an easy meal, it becomes tangled in one of a series of nets. Researchers carefully extricate it from the net, take a variety of measurements, and attach a numbered band to its leg. About three percent of birds banded here are recaptured. Based on the data collected from recapturing banded birds, sharp-shinned hawks migrating over Hawk Ridge generally head southeast to Illinois, and then southwest toward east Texas and Mexico, following the prevailing wind pattern. Sometimes naturalists bring a recent captive down from the remote banding station so that folks on the overlook can get a better view. Moments after we arrived, two naturalists called everyone over to see a couple "sharpies" in hand. To prevent the hawks from hurting the humans or themselves, the naturalists held their wings, tail, and legs gently but firmly in the fist of one hand. The birds, both hatch-year females, looked quite calm. For every mile a bird rises on this avian elevator, it can coast downwind seven miles without flapping. Still, sharp-shinned hawk' migration from the top of this continent to the bottom takes strength, endurance, and stored energy. In order to be ready for the journey, these small hawks grow furiously-going from egg to adult size in just over 7 weeks. The Hawk Ridge naturalists spent a few minutes answering questions, and then asked for a volunteer to release the bird. In a flurry of feathers, the hawk left the visitor's hand. It swooped below the cliff for a moment, giving us a spectacular "birds-eye view." With a series of graceful circles, the sharpie gained altitude. Soon the little hawk was a mere speck in the sky, one of the many birds on an incredible journey, visible only through our scanning binoculars. If you would like more information on the migration at Hawk Ridge, visit their website: www.hawkridge.org. You can also join Museum Naturalist, Haley Appleman on a Hawk Ridge field trip on September 27. Call 715-798-3890 or visit cablemuseum.org for the details and to register. "We come now to the season of restlessness and change, a time of extremes when the crisp frostiness of morning may mellow into voluptuous warmth under a benevolent sun. Fruitfulness gives way gradually to senility and decay, an erosion of life forces as the pace slows toward the time of rest. "This is autumn, when the beauty of maturity becomes apparent in the flowing colors of the leaves, in seedpod, capsule, and cone; autumn, when late-blooming flowers become rare treasures and the spider's web, bejeweled with dew, a work of art. "By day sudden swirls of birds announce the feeding of migrating flocks. By night the passage of countless others is proclaimed only by faint twitterings high in the darkened sky. Muted colors, muted sounds...a tuning down from summer's hectic pace. "Days of crystal clarity, days hazy blue or fog-enshrouded, denote the season. Summer and winter are in never-ending altercation, but with summer weakening with the passing time. The brilliance of the stars seems greater and the harvest moon repeats the antique gold of autumn leaves. Chill nights quiet the cricket's song but arouse that of the ululating coyote. The tide of plant and insect life ebbs as that of the predator rises to full flood. "Every creation in its own unique way senses the changing season and prepares accordingly. For many there is death, with only token forces remaining to carry on the generations. For some there is dormancy and rest; for some a changed but continuing activity, while others-from choice or necessity flee southward. Human response differs only in detail from that of other creatures: the instinctive urge for comfort, survival and continuity. "Chill days and scudding clouds and instinct say, "Prepare, the time of hardship looms ahead." There is an awareness, an urgency that quickens with the shortened days. There is an upsurge of fresh energy to meet the challenge of the future, a determination that makes the heart sing, not a last requiem to the dying season, but a song of thankfulness and joy. "Emerson, in his poem "Apology," wrote: "Think me not unkind and rude that I walk alone in grove and glen; I go to the god of the wood to fetch his word to men." "While I may not go to the wood to fetch back words of wisdom, I do by choice traverse it alone on most occasions. There may be many reasons for my going. I may be searching for specific plants for photographic subjects or equally practical purposes, but most often (and most rewarding) I go for the soothing, healing peace the solitude of a quiet woodland brings to me. "At this time of year the tranquility of nature seems most apparent. It is the deep-breathing pause between the hectic days of growth and fruition and the chilled dormancy of winter. Fallen leaves carpet the earth in hues that rival and outshine the crafts of the Orient. Mosses, at their greenest now, seem to glow with an inner radiance on rock and stump and fallen tree. The beauty of these lowly plants is equal to the fairest flower or mightiest tree. Mingling one with another, they clothe the raw earth and decaying wood in protective emerald garb. "Beneath tall evergreens one can move in cat-footed silence over moss and needle-cushioned ground, seeing, hearing, and feeling the serenity of a natural world. Being alone in this way is not being lonely. Freed from the need for conversation and the distractions of everyday affairs, one can open the doors of the mind, airing out the pettiness, discord and annoyance. "Truly there is great wisdom here if willing hearts and open minds can accept it: the endless patience of forest and earth to renew themselves despite the many violations wrought upon them by man; the lack of malice among wild creatures who prey upon one another only to sustain life but never in spite or rancor. And there is hope and faith, for even as the dying leaves color the earth, the trees and shrubs are putting forth new buds for the year to come. The seed, fallen to the ground, bears the germ of the plant yet to come, and the bulb beneath the earth bears within its heart next summer's flower. "These things speak to me in my solitary walks. They speak in the still, small voice of the spirit and I am strengthened and renewed." We were grateful for the light breeze that sent our patio umbrella flapping, and also for the shade of said umbrella. Somehow we'd chosen what may be the last hot day of summer to go on our annual bike adventure. Eighty degrees and humid over the course of almost twenty miles was sufficient to get the sweat dripping. It was worth it, though to swoop through the hilly backroads of the Chequamegon National Forest and emerge from the woods at the Farmstead Creamery and Café on the North Star Homestead Farm. Run by a family of strong and talented women, this diversified network of pasture-raised poultry, sheep, and hogs, as well as raised-bed gardens, a high-tech aquaponics system, and permaculture practices, draws lots of hungry admirers. An outside table with a big umbrella was the perfect place to relax and wait for our home-cooked, local, organic, delicious lunch to arrive. And then, my day got even better. Movement spotted out of the corner of my eye resolved into a small wasp carrying a green caterpillar. The caterpillar was about the size and diameter of the wasp's own body (1/2 inch by 1/8 inch), but neither seemed to be struggling. The wasp hovered and wandered for a bit in the vicinity of the shade umbrella's crank arm. Finally it landed, and started the slow process of dragging the limp larva into the mud-caked hole in the end of the crank's handle! As you can imagine, I was pretty excited. While watching this drama, one of the farmers popped out of the Café carrying our plates of food. Naturally, I waylaid him at the table and made him check out the action. I'm not sure he knew what to make of it-or my enthusiasm-at first, but I think I convinced him to be impressed before he went back inside. After a few minutes, the last segment of green disappeared. Then, suddenly, the wasp backed out of the hole and flew off! Over the course of lunch, I had to put down my delicious pesto-melt sandwich several times to capture photos of the wasp landing, and its black-and-yellow-striped abdomen circling all around just inside the entrance to the little mud and metal nest. It brought a load of something each time, but never another caterpillar while we watched. The bundles clasped in its forelegs were dark and amorphous. After our amazing dessert of sheep's milk gelato (blueberry fudge flavor-yum! ), we started the long, hot ride home. Using an amazing website called Bugguide.net, which is hosted by the Iowa State University Department of Entomology, I posted my blurry cell phone photos for identification help. Within hours, a contributing editor with experience in wasps replied with a name: Eumeninae. Now, understandably, my fuzzy photos don't give enough information to identify this wasp to species. Even so, just knowing the subfamily it's in gives me some clues to its lifestyle. Also known as potter wasps, this diverse group of solitary wasps use mud to create a variety of nest shapes. Some potter wasps make round-bottomed, narrow-necked nests that look exactly like traditional pots. Legend has it that some Native Americans based their pottery designs on these nests. Other potter wasps make their nests in pre-existing cavities, like the end of a crank handle on a patio umbrella, or any other hollow or crevice they can find. Also called mason wasps, they use mud or sand for construction. Inside each nest chamber she constructs, the female wasp lays just one egg, and then goes about the business of storing up baby food. Adult potter wasps eat nectar, but for their growing offspring, they collect moth larvae like the tiny green caterpillar I witnessed going to its death. Beetle larvae and spiders may meet a similar demise. In any case, the adult delivers a paralyzing sting to the prey, but the toxin does not kill them. Dead larva would soon decompose. These stay fresh but immobile, ready for the hungry wasp larva to hatch and start feasting. It might take anywhere from a few weeks to a year for the larva to pupate, metamorphose, and mature. Then, with powerful jaws, the adult wasp breaks open its earthen nursery and emerges to find a mate. Although I can't be certain that this Euodynernus wasp is the same species as the one I saw, the irregularly-spaced yellow stripes match my photos. Adult potter wasps feed on nectar and pollen. Photo by Bruce Marlin, Wikimedia Commons. While watching this black-and-yellow lady go about her business, two main thoughts were swirling through my head. The first was the importance of a healthy insect population on an organic farm. Using pesticides would have killed off this predator, removing a completely free source of caterpillar control. The North Star Farmstead is doing it right. The second thought was about just how tightly packed this world is with LIFE. Every nook, every cranny, every surface, is someone's home. Experiences like this make me especially glad that it's my home, too.